Marking the first overseas trip of the first pope from the Americas, the pontiff said the church is committed to the Amazon Basin over the long term. The Amazon rainforest extends across 5.5 million square kilometers (2.1 million sq miles) of the Amazon Basin. One in 10 known species in the world lives in the Amazon rainforest, which is threatened by human settlement. About 60 percent of the forest is within Brazilian borders. “The Church’s presence in the Amazon Basin is not that of someone with bags packed and ready to leave after having exploited everything possible. The Church has been present in the Amazon Basin from the beginning, in her missionaries and religious congregations, and she is still present and critical to the area’s future,” said Pope Francis in the longest speech of his papacy to date. “I think of bishops in the forests, traveling up and down rivers, in semiarid places, in the Pantanal, in the pampas, in the urban jungles of your sprawling cities,” said the Argentine-born pontiff. The Pope referred to the Aparecida, a 2007 document adopted at the Fifth General Conference of the Bishops of Latin America and the Caribbean, which was held near the Shrine of Our Lady of Aparecida, Patroness of Brazil. The Pope formally launched his five days of events in Brazil on Wednesday by traveling to this cherished shrine which honors the Virgin Mary with a dark-skinned statue. 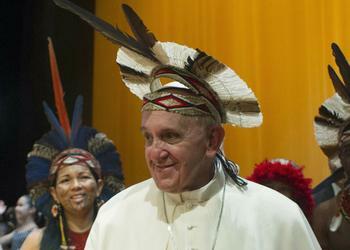 At an event in Rio de Janeiro’s Municipal Theater for several thousand of Brazil’s political, business and cultural elite on Saturday, Pope Francis met several indigenous Amazon men with pierced noses, body paint, feather headdresses and straw skirts who told the pontiff they are fighting to preserve their traditional lands from development. After his address, the Pope was greeted by well-wishers on stage, including the Indians from Porto Seguro in Bahia State, who said they were Catholics. 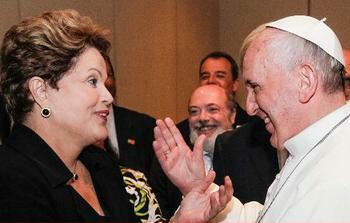 They knelt down and kissed the hand of the Pope, who blessed them. One of them, Ubirai Matos from the Pataxo tribe, removed his feathered headpiece and gave it to the Pope, who donned it and smiled for photographers. The Pataxo, with a population of about 2,790 individuals, have never renounced their territory and never acknowledged the “rights” of newly created landowners to dispossess them. The government provided heightened security for the papal visit, with more than 28,000 police officers assigned to the week of events, which culminated in the celebrations of World Youth Day Sunday on Rio de Janeiro’s Copacabana Beach. Some three million people gathered on the famous beach for the final mass of the Pope’s visit to Brazil. They included the presidents of Brazil, Argentina, Bolivia and Suriname, and the vice presidents of Uruguay and Panama.